The Halmich artifact collection was donated to the Department of Natural Resources by Mr. Estel Darwin Halmich. It is on display at the Division of Geology and Land Survey office in Rolla, Missouri. Mr. Hamlich lived in Bourbon, Missouri and began his collection in 1929. 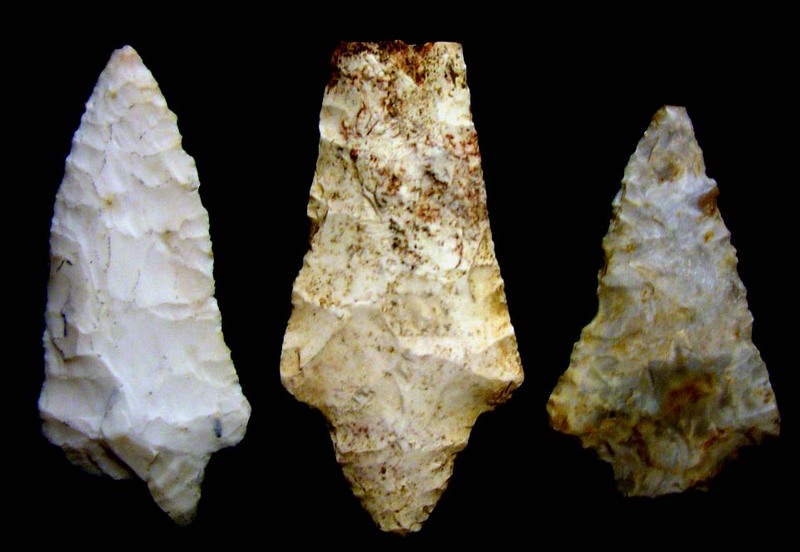 At least some of the artifacts were collected in the Bourbeuse River valley of Gasconade and Franklin Counties, Missouri. 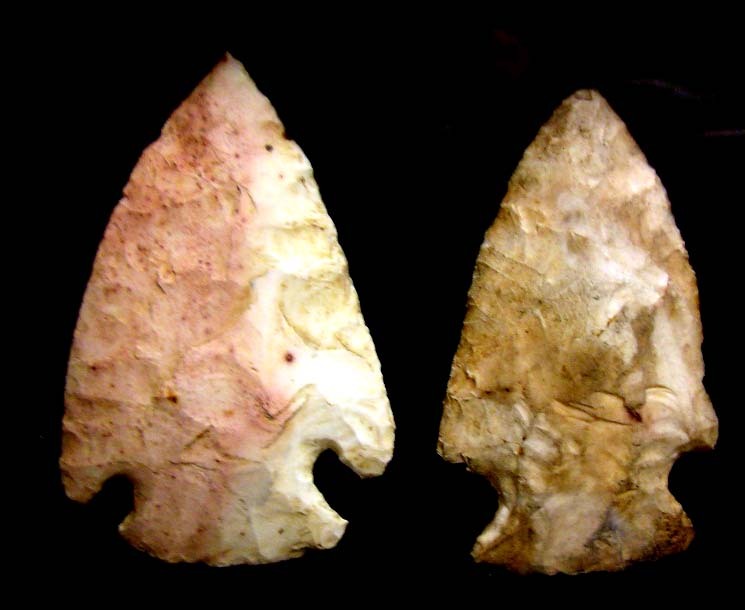 It is likely that some of the artifacts came from Crawford County where Bourbon is located. Unfinished Clovis point. Approximate length = 63 mm, width = 28 mm. 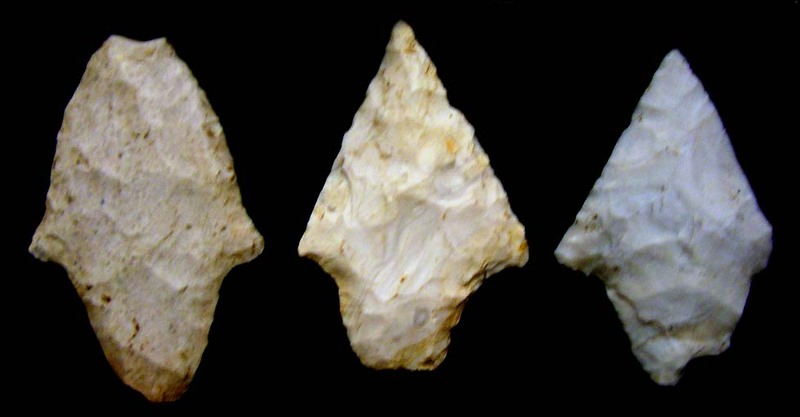 Clovis point. Approximate length = 85 mm, width = 26 mm. 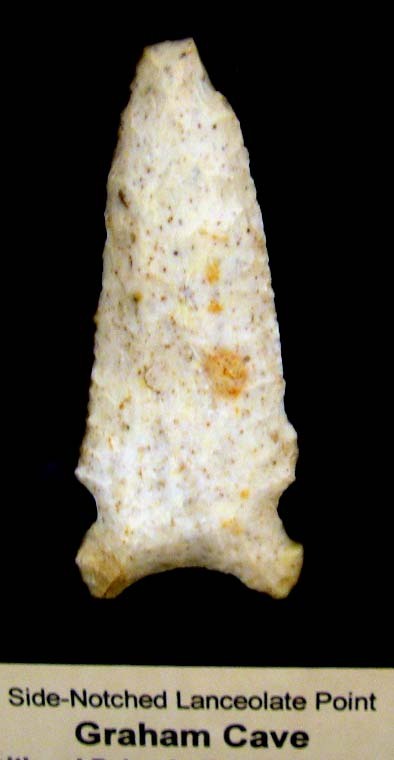 Dalton point variant (Late Paleo-Indian Period). Approximate length = 63 mm, width = 23 mm. 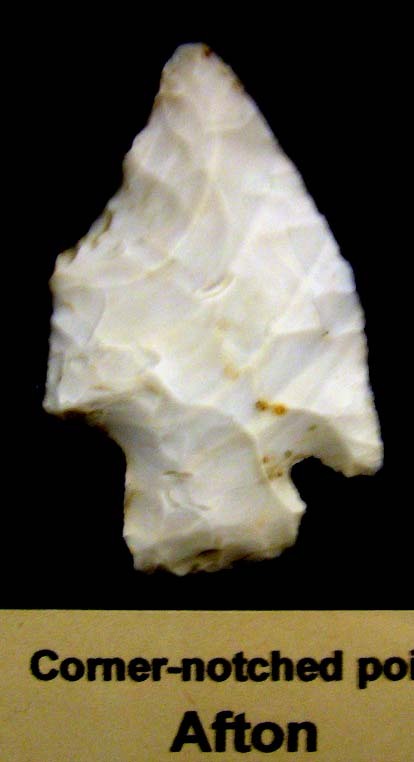 Graham Cave point (Early Archaic Period). Approximate length = 71 mm, width = 30 mm. Etley points (Late Archaic Period). Left Approximate length = 71 mm, width = 39 mm. Right Approximate length = 88 mm, width = 28 mm. 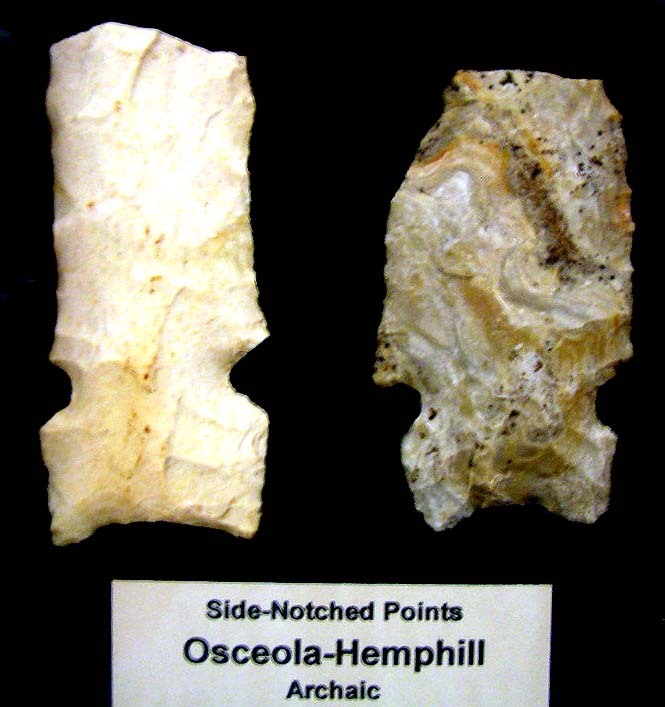 Osceola points (Late Archaic Period). Left Approximate length = 71 mm, width = 32 mm. Right Approximate length = 63 mm, width = 36 mm. 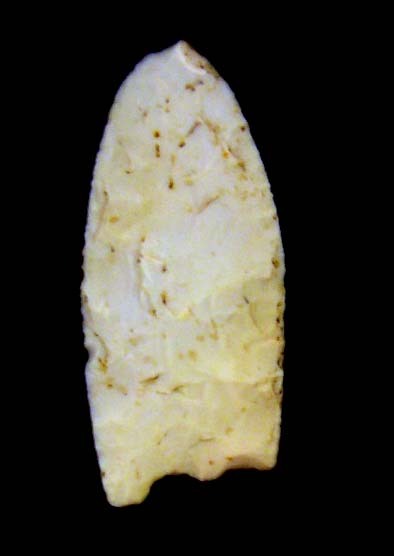 An Afton point (Late Archaic Period). Approximate length = 45 mm, width = 29 mm. Contracting Stemmed points (Woodland Period). Left Approximate length = 78 mm, width = 35 mm. Middle Approximate length = 80 mm, width = 39 mm. Right Approximate length = 66 mm, width = 40 mm. Contracting Stemmed points (Woodland Period). Left Approximate length = 55 mm, width = 36 mm. Middle Approximate length = 52 mm, width = 34 mm. Right Approximate length = 51 mm, width = 33 mm. 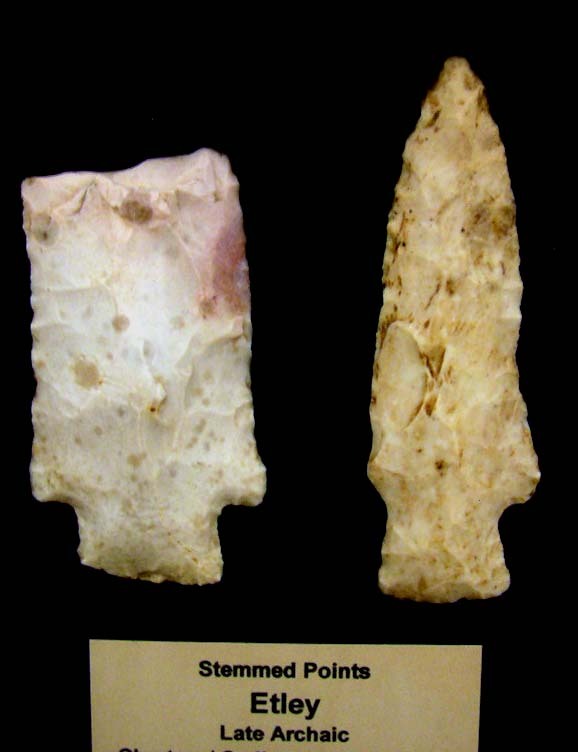 Corner notched points (Middle Woodland Period). Left Approximate length = 62 mm, width = 41 mm. Right Approximate length = 59 mm, width = 34 mm. 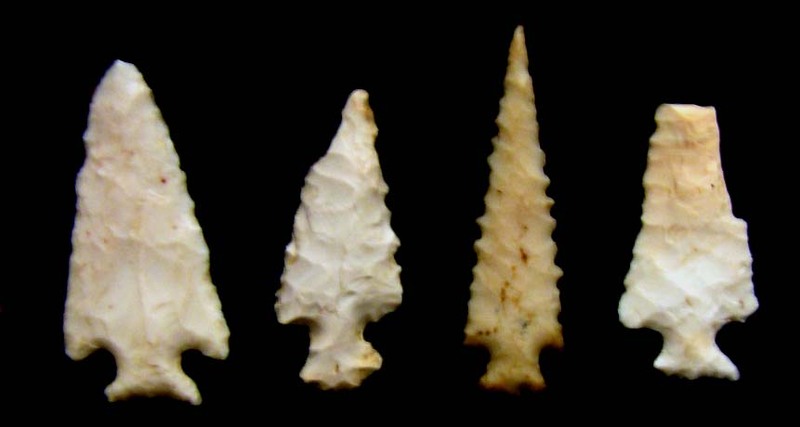 Corner notched arrowpoints (Late Woodland Period). Left Approximate length = 37 mm, width = 18 mm. Left Middle Approximate length = 32 mm, width = 14 mm. Right Middle Approximate length = 38 mm, width = 11 mm. Right Approximate length = 29 mm, width = 15 mm. 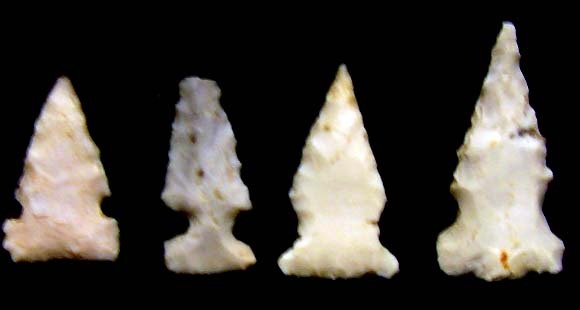 Arrowpoints (Mississippi Period). Left Approximate length = 19 mm, width = 12 mm. Left Middle Approximate length = 20 mm, width = 9 mm. Right Middle Approximate length = 22 mm, width = 12 mm. Right Approximate length = 26 mm, width = 13 mm. Special thanks to Dr. Patrick Mulvany, Chief Geologist of the Geologic Data Acquisition and Management Section of the Division of Geology and Land Survey office, who organized the exhibit of the Halmich collection and kindly provided information about the artifacts. Jack Ray (an archaeologist at Missouri State University) and John Bradbury (an historian and an archivist in the Western Historical Manuscripts Collection, University of Missouri, Rolla) helped in classifying the collection before it was placed on display. A warm thanks to Neathery Batsell Fuller for her advice on the content of the webpage.